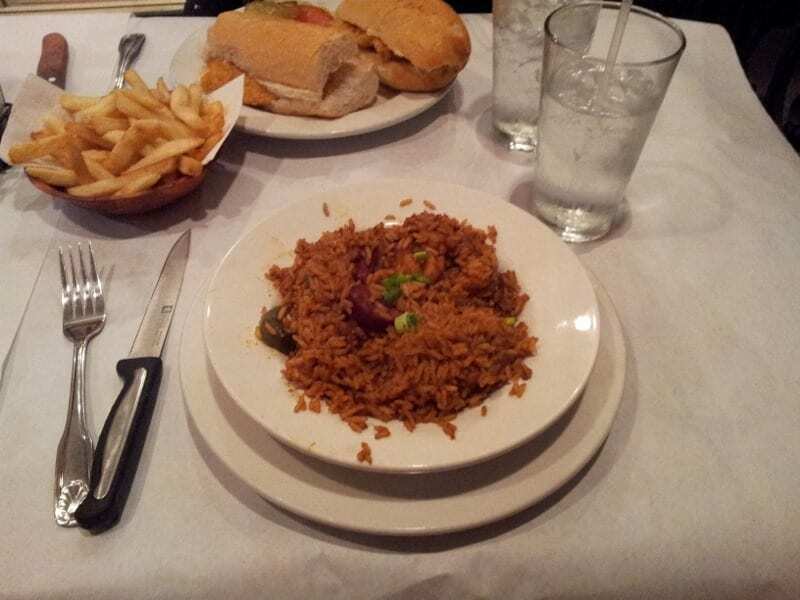 Yesterday I carb loaded at a hole in the wall with some Jambalaya. The service and food were just mediocre so I won’t mention the place. But, this was my first Jambalaya experience and I liked it! I LOVED the beignets! LOVED. The fresh donuts come in an order of 3 covered in powdered sugar and are served warm. Heaven. This is in the top 5 foods I’ve ever eaten. 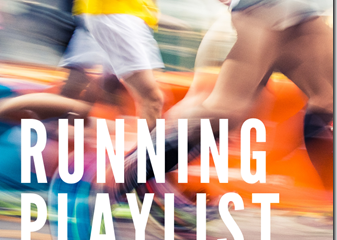 Possibly #1, but I need to review my list. Boom. I carb loaded some more with some beverages and a banana. 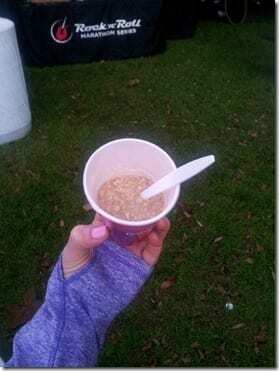 Right now in my life I’m into having oatmeal before races. I met reader Ciry this morning and saw a lot of other readers along the course. Hello Sarah! Jackie, did you get your PR?! 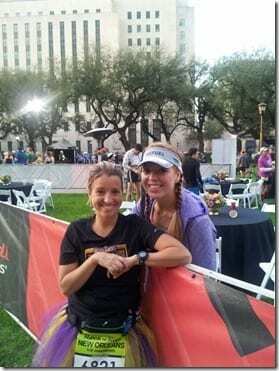 Chandra and I in the VIP area where I was 20 feet from Kara Goucher. Die. (She’s sitting the yellow jacket!) Yes, I’m sorry I’m a creeper. The race was awesome!!! 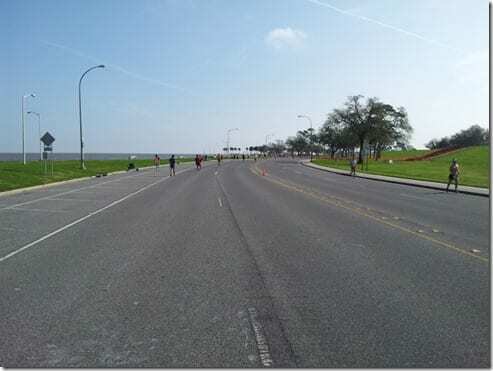 The course was super flat (#1 reason I offered to pace Dave) and it was great running around NOLA. And Dave got his new PR in the full 4:20:38!!! I think I’m going to get a job as a pacer because it was super fun to help someone hit a running goal. I only had to say 2 bad words to him to keep him going, the rest of the time I was positive and encouraging He might report differently, but who you gonna believe? After the race I hung out with two of the most impressive runners ever – Dave and Marathon Man! These guys will run more races by May then I’ll run in my life. Okay – time to explore the city! Question: What was the best thing you’ve eaten this weekend? I’ve wanted to visit New Orleans for a while. Congrats on all the races you’ve completed. Great recap and great race! 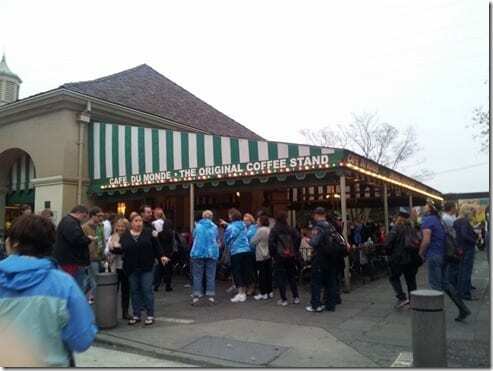 I was there last weekend as well and also “carb loaded” at Cafe Du Monde. 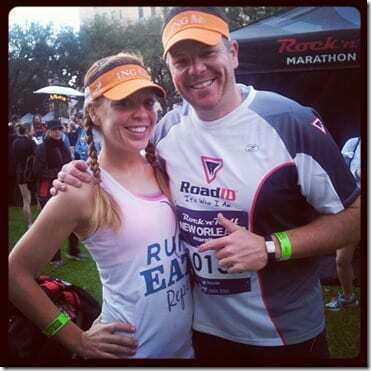 Check out my recap @ http://www.runningforit.com if you are so inclined. Saw you on the course around mile 8 or 9. 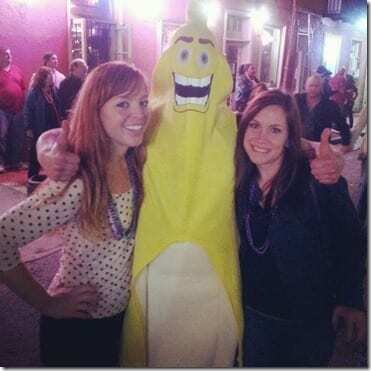 I have been behind in reading your blog or else I would have known you were going to be in NOLA. I hope you had a good time and that you got some good hospitality from Louisianians! ooh…I never thought about all that great food in NOLA. What a great place to run a marathon. Great job pacing your friend! I paced a friend in her first marathon and loved every second of it. 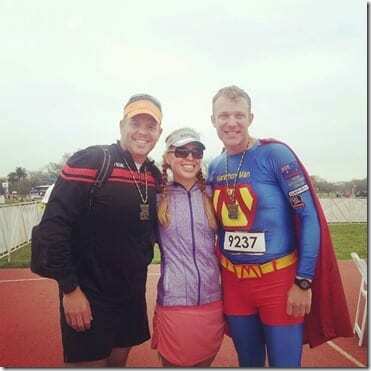 Nice job…so awesome that u did the marathon on a whim! the best thing i ate over the weekend was chargrilled oysters from Drago’s over at the bottom of the Hilton (by Harrah’s) in New Orleans! It was THE BEST thing i’ve EVER eaten! So delicious! my mom ran this race also! i was wondering if i would see any bloggers there but sadly I missed you all. Hope you enjoyed new orleans! Awww! Hopefully we’ll meet next time! Looks like a blast! 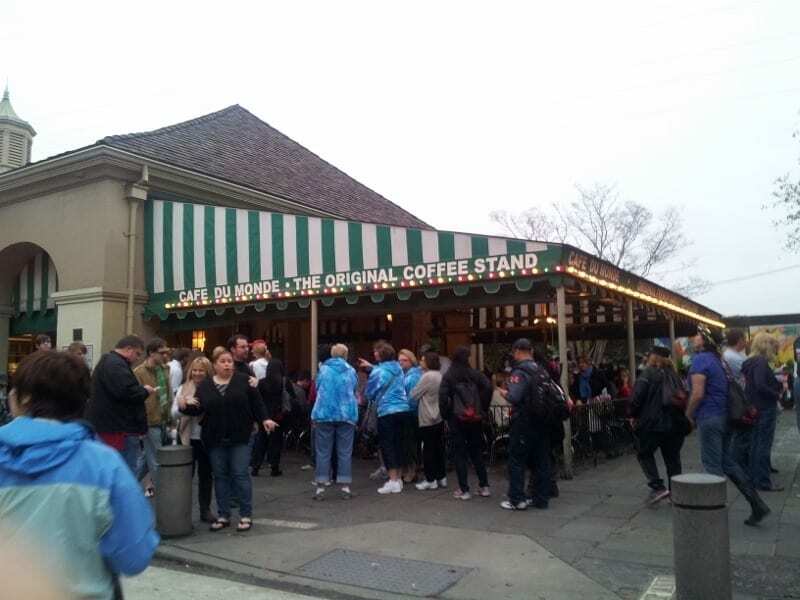 And the beignets at café du monde are a must :). I think the best thing I ate over the weekend was this awesome “rainbow” flatbread (pesto, carrots, purple potatoes, sundried tomatoes, kale, green peppers, carmelized red onion, mushrooms, little bit of cheese) and a local oatmeal stout on a date with my boyfriend last night– yum! I almost did that race! Glad to hear you had a good experience there… and extra rewarding as a pacer. That would be so rewarding to see a friend get their pr! Green Goddess is my fav NO restaurant. Nice work on the run! I have never had that dessert, but feel free to send some my way. Yum! 1) I had an awesome salad for dinner Saturday, with my new man. So far he’s being really supportive of my desire to clean up my eating again and reach my goals. It’s great to have that kind of support. 2) You are absolutely amazeballs. For serious. One day I’d love for you to pace me. When I no longer have pneumonia and have lost 40lb and can do faster than a 15 minute mile. Yeah, I know most people can WALK at that pace.. not this girl, not anymore. Le sigh. That must feel so wonderful to be able to just BOOM up it to a full and pace a friend so perfectly! So totally cool that you are able to make something like that happen. Way to go! It was nice to finally meet you. Thanks for linking me!! Ohhh, can you pace me for a 4:20 too? How about you get a BQ, and then pace me to my BQ post baby?? That would be awesome. I could even pay for your entry….and let you shack up with me. I can’t pay for a flight though, so we’ll need to look for another “sponsor”. Hahaha. I went to ikea for the first time and had their chocolate overload cake. It was fantastic and I plan on stopping at every ikea I ever see just got that cake. Glad you had a fun race! Enjoy NOLA and grab some oysters at acme! Nice to see you on the course; I’ve been a reader for awhile now! Great job pacing! I don’t know if I could trust myself to be a pacer. That’s a lot of responsibility, good job! I ate a ton of delicious food this weekend. On Saturday a delicious batch of cupcakes (for the kids. I opted for a few Girl Scout cookies! haha!) and we had BBQed pork chops and baked potatoes with a fresh salad and homemade honey beer bread. That bread is SO easy and so delicious. Hey saw you at the race great job! The course was great wasn’t it? So nice to have a flat course the whole time! Yes super flat! How’d you do? WooHoo – way to go on the full (as a pacer even!!). Beignets from Cafe du Monde are high on my list of favorite foods ever. 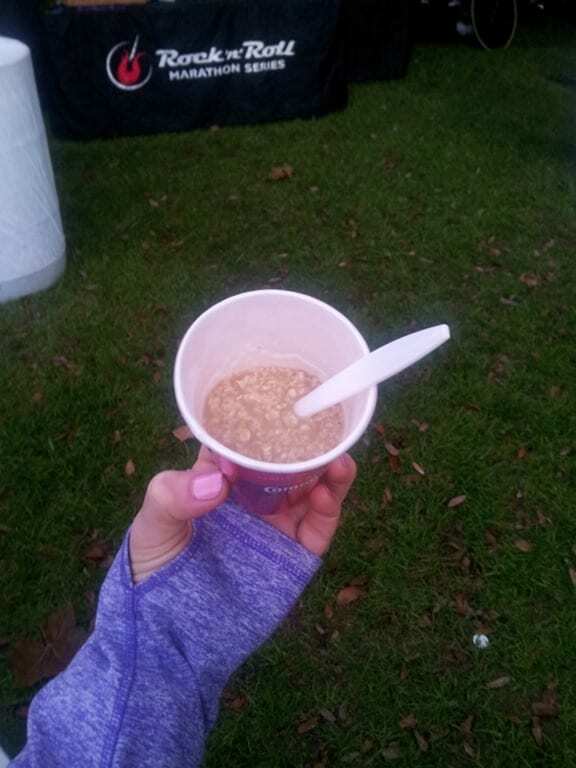 This weekend I made my first gumbo – in honor of the New Orleans marathon (or cause it sounded good with all of the snow here!). I think that’s pretty awesome you paced someone – you helped them achieve a goal! I’m sure you’ll remember this race among your dozens this year as a special one. Great job on the race! Have fun in NO! Looks like you had a fabulous time. What a trip! NoLa is definitely on my bucket list. Got my PR! I thanked the random lady who I followed in the chutes. She was a little confused. I called her my rabbit, but really, she was just a stranger running even splits at the pace I needed. (Now I sound super creepy. 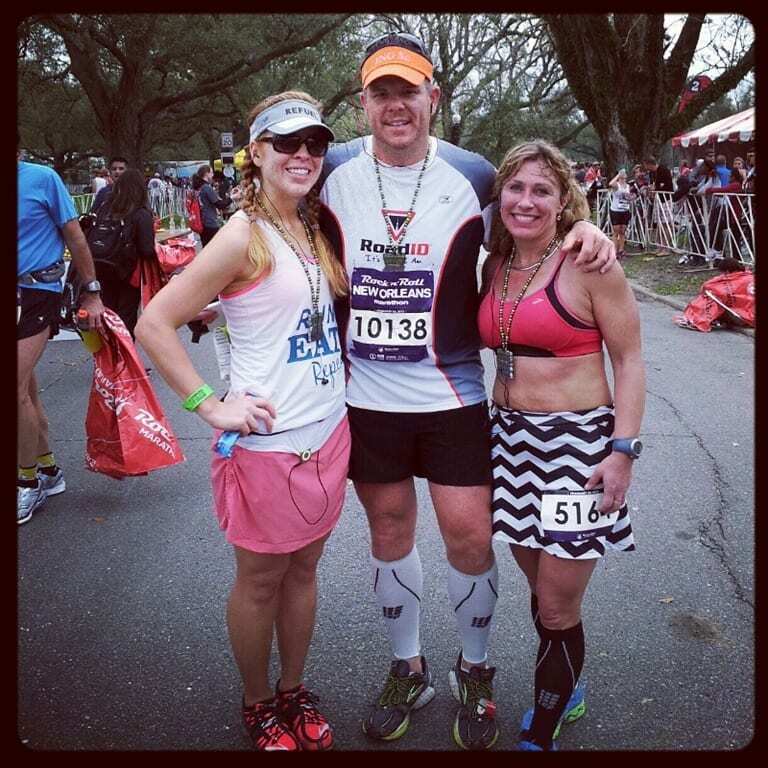 In my defense there were no pace groups, so I improvised) NOLA was my first sub 2:00 half. Considering recent knee issues that forced me to the half instead of the full, I am reasonably pleased. Glad to hear you had a great pacing experience! Had a great Chinese dinner with friends in Hong Kong; we ran the Standard Chartered Hong Kong Marathon 42, 21, 10 km) earlier in the morning. Great food, even more fabulous company. I saw you today at the race. 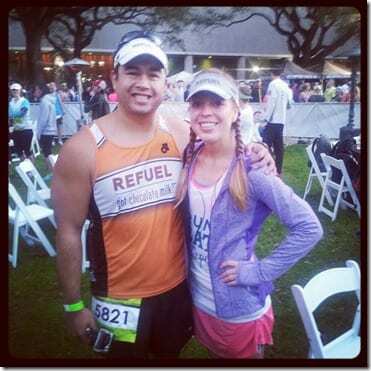 I just ran the half but I recognized you from Skinny Runner’s blog. I would have said something but it was mile 10 and I was pushing for a PR and practically dying. I live (and went to college) about 3 hours away from NOLA, and we would take road trips in the middle of the night to get beignets. Ahhhh to have that freedom (and metabolism) again! Good job! That’s awesome you upgraded to a marathon! By the way, I’m drooling over your food pics! 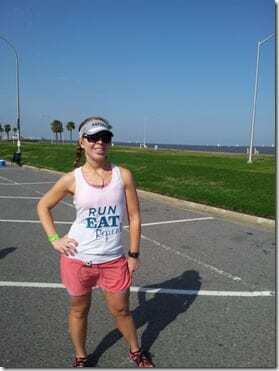 quick question I’m asking all you marathon-er’s – do you wear sunglasses and if so are they running sunglasses? I have my first 1/2 next month (gulp!) and I hate squinting and running and yet every pair of running glasses I try on look so…manly. I know its not all about how you look when running but well it’s all about how you look when running!! advice? http://www.colorushealthy.com CONGRATS btw, god I hope to do a full someday! I usually wear running sunglasses, but at the race I wore “regular” ones because I’m trying something new. My normal ones are manly. Are you ever going to address your recent weight loss? Before you head out of town, treat yourself to breakfast at Oceana (corner of Conti and Bourbon). French toast was to delicious! PEed by 1:46 and it was my first sub 2:00 half. I made sure to thank the random lady in the polka dotted shorts who pulled me through. She was really confused… It was a great race! 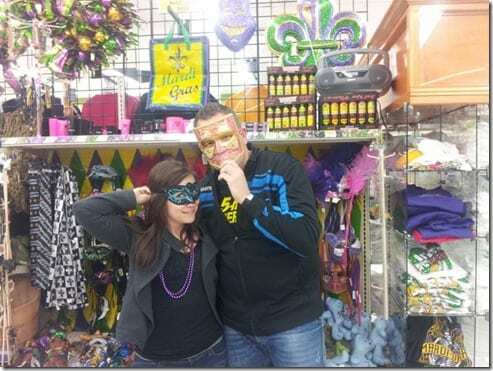 i have never been to new orleans, but it’s on my bucket list. i’m glad you had a great race and have the opportunity to explore such a fun city! Ended my 20 mile run at Yogurtland! I think it tasted especially good after that effort. 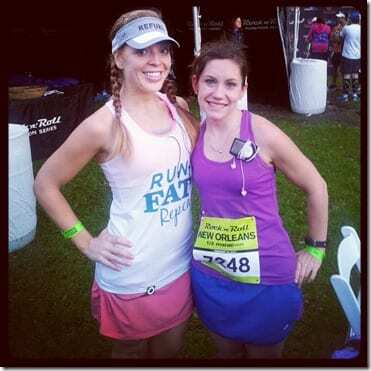 Congrats on RnR NOLA! I’d love to have you pace me to a 3:59:59 🙂 Love your purple jacket in that last pic, you look great! We ate at Gabbi’s in Orange for the first time- whole meal was fantastic from the guacamole to start to the homemade churros to finish. I think I need to go there. It’s really great, just make reservations (the wait was 3 hours for people who hadn’t). I didn’t eat anything exciting this weekend 🙁 I would love to get my hands on those beignets though! Oh, the day I can decided on a dime to run a marathon. Go you! I’ve been doing a lot of interval running, but not really any distance. Need to jump on that. Enjoy the rest of your trip. It’s a really fun city! Best food = the indian we had at a random restaurant in D.C. last night. Or maybe the pizza I had at 2:30am. Hi! I’m the girl who said hello to you in my car along with my husband and 2 kids. Thanks for coming up to us to say hello and for being so friendly! So glad you enjoyed the city, the race, and the food. I had a great time today and hit a PR! Hello Carol!!! Nice to meet you – how’d you do? This was only my second half marathon. 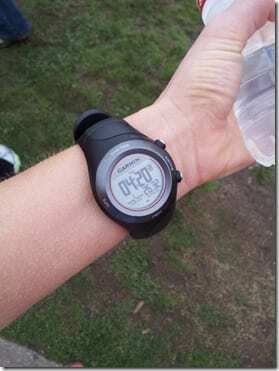 I PR’d by two minutes. 2:12:07. Contemplating running a full marathon at either the end of this year or beginning of next. Summertime in Louisiana really messes with training so I have to be careful. Hope you have a safe trip home! I’m so jealous you were so close to Kara! Looks like you are having a blast in NOLA! 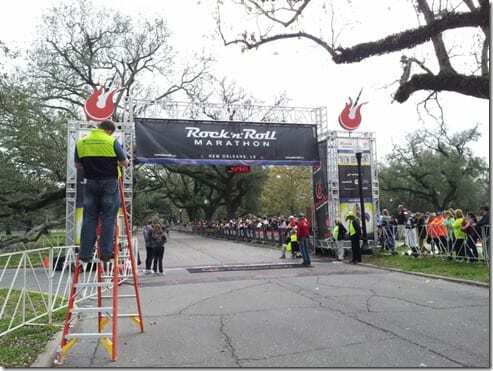 How do you just switch it up to a full marathon and not get hurt? You must have legs and knees of steel. Go to The Central Grocery and get a muffalata sandwich. It’s Italian meats with an olive spread. Delicious! So much good food there. Lucky that my in laws send us lots of food from NOLA! 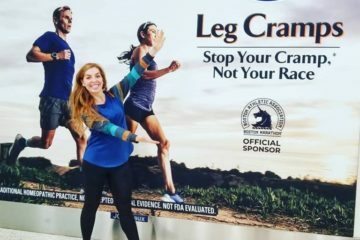 Your arms are looking great, can you post about what arm moves/ strength training you are doing in addition to running? First – love your outfit. You are really looking fab! Second – you running machine!! Congrats on another marathon! 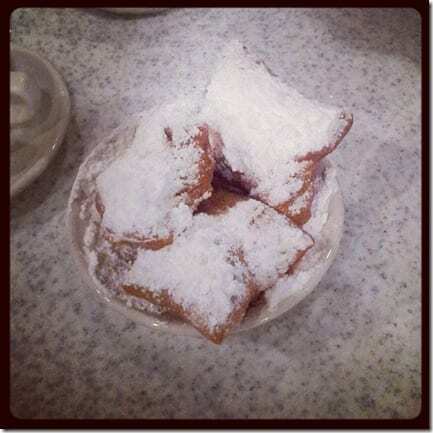 The beignets from Cafe Du Monde i had yesterday also! They are so tasty. 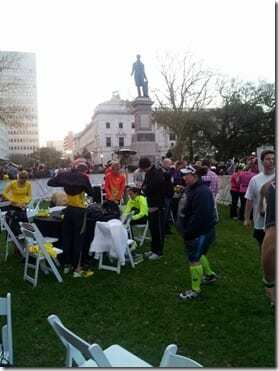 I pr’d the NOLA course today! So excited but man marathons are sooo tough. This was my second, maybe my last? Fun pacing job! Good work and love the shirt/skirt/shoes combo! 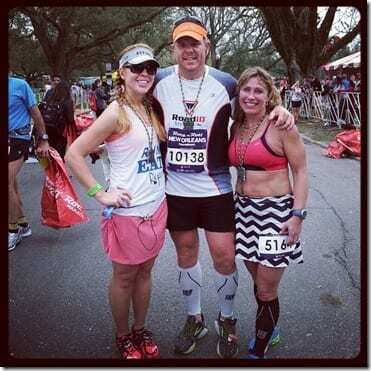 I think I’m going out for the RnR 10k – stay tuned! But, I think we should do something sooner – any suggestions? Hartford? Congratulations to Dave on his PR. What a great friend you are to help him get it! Best thing I ate this weekend was some warm brownies and ice cream. I am indulging a bit too much lately trying to get through an injury. Oh well, life is short! I’m so sad I missed you, but happy you are loving NOLA. Hope to see you back here next year, maybe I’ll be brave enough to attempt the full then! I personally love Charbroiled Oysters!! Looooove New Orleans, it’s one of my favorite cities!